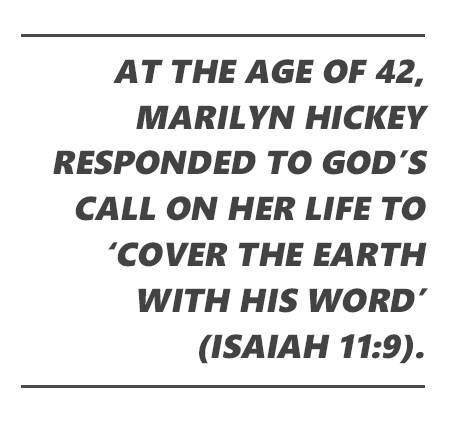 At the age of 42, Marilyn Hickey responded to God’s call on her life to ‘cover the earth with His Word’ (Isaiah 11:9). The natural inclination to reach out, to celebrate people and culture, were traceable in Marilyn’s formative years; yet she had no idea how God would send her around the globe teaching the Bible and building bridges with people of all cultures and religious backgrounds, especially in the Muslim world. The Lord has continually opened doors of opportunity for Marilyn in over 137 countries. This includes private meetings and prayer with high-ranking Muslim and Hindu government officials. Her lectures on healing and the Bible have broken records for the largest public meetings ever held in that nation’s history, including Cairo, Egypt, and Pakistan. Sarah Bowling was just five years old, on a trip to the Holy Land, when she had her first interaction with an Arab person. Since then, Sarah has ministered around the globe. It was on a ministry trip to Northern Ethiopia in 2009 when Sarah, holding newborn twins who were abandoned in a field, felt compelled to start Saving Moses. This humanitarian initiative assists children ages 5 and under with basic food, water, shelter and medical needs. Together, Marilyn and Sarah’s mission to bring people into relationship with Jesus Christ often lead them to difficult places, including Muslim nations and lands oppressed by communism, cruel dictators, poverty, disaster, and disease. Year after year, they cross unfriendly borders with Bibles, teaching materials, and books translated into native languages, often at great personal risk, carrying the gospel into scores of nations including Pakistan, Italy, Morocco, Ethiopia, Sudan, Russia, Panama, Australia, China, Germany, India, The United Kingdom, Vietnam, and dozens more. It’s simple. When we live the truth of the Bible, we can experience the blessed, miraculous life that God’s Word promises, including bringing people of different faiths together, leading people to Christ, and helping those in need.